This additional page on the Biltmore Estate Scrapbook focuses more on the areas outside of the Home itself to capture the beauty of the Grounds and other structures. 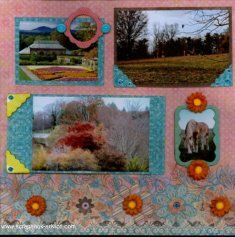 We hope you will be able to use these Biltmore Scrapbook layout ideas with lots of Techniques on your own layouts. Our trip to Biltmore Estate in November 2011 had us driving the Estate just at the end of the Fall season and we had to capture the beauty of the turning trees for our Biltmore Estate Scrapbook. Papers (with the exception of Ivory Card Stock for Photo Mattes), Tags and Floral Embellishments were from the January 2011 Personal Shopper Kit. The floral background paper came with the decorative edge which actually made the page larger than 12 inches wide. I cut off 1 inch from the straight side and added a dark brown strip of paper to show off the border. 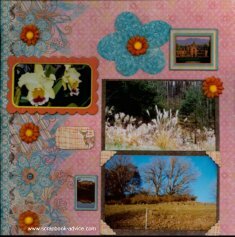 Purchasing or making decorative edge papers is a simple scrapbook technique to quickly make beautiful pages. Photos were matted with Ivory and Dark Brown. The photos on the right side layout were from post cards purchased at one of the Estate shops. Again, using items supplied with the Personal Shopper Kit for Jan 2011, the Floral Embellishments were made using a green artificial leaf and two additional leaves cut the same size from dark brown paper. After cutting the paper leaves, I drew veins on them, inked the edges with some copper metallic ink, and then distressed the leaf shape. To distress, I took the handle end of my scissors (or any smooth surface) and rolled the handle across the paper while it was in the palm of my hand just enough to give it some curve. After the leaves were made, I added some little mini roses made from net, added a copper brad to the center of them and touched them up with some orange ink to match the paper. The Tag from the Kit was part of a sheet of "Color Me" paper where the gold embossing is originally on white card stock, but when inked - with orange ink in this case - the ink is wiped off the gold embossing before it dries. 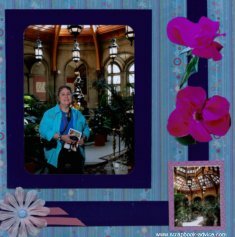 These next 2 layouts from the Biltmore Estate Scrapbook use 2 postcards of the Conservatory and Walled Garden. The background paper is called Blue Stripe Flocked which has a lot of wonderful texture and is from the Personal Shopper Kit from July 2010 as were the ribbon, large and small brads, silk flowers and Dazzles which are silver 3-D Floral Stickers. Scrapbook-Advice.com Tip: The white block is reserved for journaling which will be done by computer on a transparency and adhered with more small brads. You may notice that the dazzles have been placed over the journaling block and over the photos as well, so the scrapbook technique of journaling on a transparency will allow all that to show through. 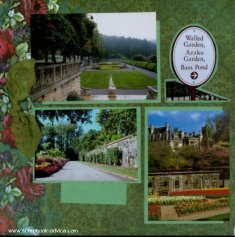 Thes layouts of the Biltmore Estate Scrapbook Grounds focus on the plant and animal life seen around the Estate. All supplies used on these layouts are from the December 2010 Personal Shopper Kit and include all the papers, small chipboard frames and photo corners, silk flowers (Orange here, but also Pink) and holographic dazzles for accents on the photo corners flowers and images on the background papers. 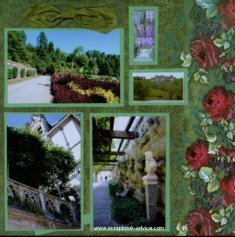 The photo on the upper right was from a brochure received at the estate and I added the Chipboard Frame over the text on the picture to accent the text "Walled Garden in Fall". The 2 very small photos on the left page are from stickers purchased at the Estate and are placed behind 2 more of the chipboard frames. I like this scrapbook technique of using ready made frames to showcase your smaller photos. 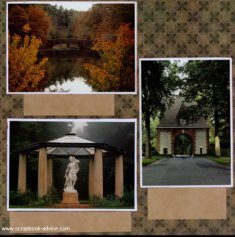 These next layouts from the Biltmore Estate Scrapbook focus on the House itself and some of the other structures around the Estate, like the Lodge Gate (Entrance), the Statue of Diana, the Bridge over the Bass Pond, and the new Inn at Biltmore Estate. The paper on the left with the photo of the House was from a Scrapbook kit purchased at the Estate. The paper on the right and photo mattes were from the January 2010 Personal Shopper Kit. Photo post cards were used for one photo of the house on the left and all three photos on the right and were purchased while at the Estate. 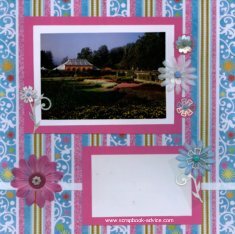 Scrapbook-Advice.com Tip: Journaling will be added by computer to a transparency that will be adhered to each of the tan journaling blocks and will be taken from the information on the back of the post cards. This allows the color of the journaling block to show through and the journaling can be added later without having to run the journaling block through the printer. 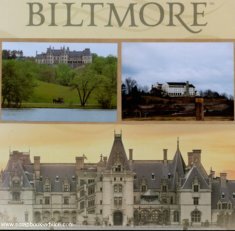 These 2 layouts from the Biltmore Estate Scrapbook used the professional photos that are taken inside the Estate along with 2 small photos from the brochure. 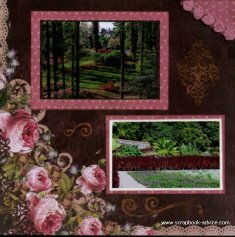 Additional photos of the Rose Garden and two cropped into the shape of the flowers were used as they matched the magenta color of the design in the background paper. I use the scrapbook technique of creative photo cropping in many of my layouts. The background paper, pink photo matte, silk flowers, brads and pink ribbon were all from the June 2010 Personal Shopper Kit. 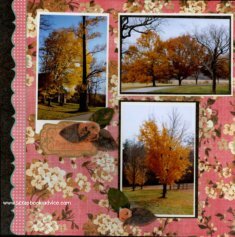 More examples of Creative Scrapbook Photo Cropping. Scrapbook-Advice.com Tip: Since I used the 2 professional photos from the package, I cut up the frame from the photo package and used that to frame the photos and to add the same color accent border on each page. 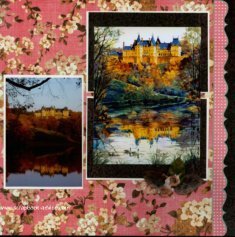 in these Biltmore Estate Scrapbook Layouts that show more from the Walled garden use a beautiful Floral Background paper from the January 2011 Personal Shopper Kit. The Rose border on the corners of each sheet of paper are turned to make if flow diagonally across both sheets of background. The photo on the left and upper right page were purchased at the Estate. 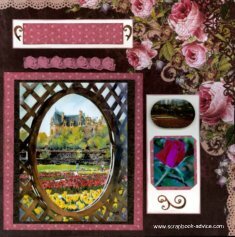 Also used on these layouts are mattes and journaling blocks from Ivory Cardstock from my stash, accented by a rose picture cropped very small, an oval embellishment purchased at the Estate Bookstore along with the Scrapbook Kit and some Pink Net Roses also received with the Kit. 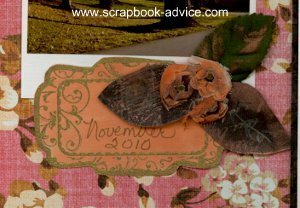 Scrapbook-Advice.com Tip: Also used were several Flourish Dazzles from the Jan 2011 kit that were inked in Copper Staz-On before being added to the pages. If you get the kit from Personal Shopper they suggested this idea along with a lot of other ideas to use their kit items. 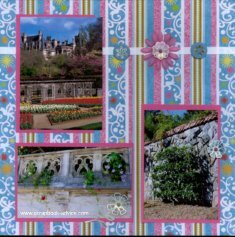 These Biltmore Estate Scrapbook Layouts of the Walled Garden use Paper and Ribbon from the September 2010 Personal Shopper Kit. Two photos on the left page were purchased at the Estate and the two small photos on the right were taken from brochures. All photos were matted on a solid green paper with the only embellishment being wide Green Satin Ribbon tied in the center and cut at an angle. Scrapbook-Advice Tip: I took a photo of the Sign for Walled Garden and cropped it and matted it to use instead of Title for the Pages. If you don't use the photo as a journaling block, you can at least use it to remember the proper name of the area. 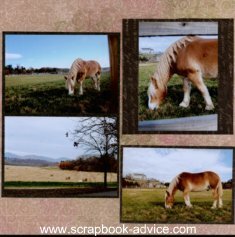 While driving around the Estate we ran across these stunning horses in a pasture and just had to get some photos for our Biltmore Estate Scrapbook. All papers used were form the January 2011 Personal Shopper Kit and were a dark brown print for mattes and tan print for background. Scrapbook-Advice.com Tip: There are no embellishments on these pages with the exception of a dark brown journaling block on the left page. 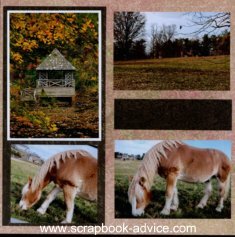 The Scrapbook Journaling will be done with Metallic Scrapbooking Pens and will be the text from the back of the post card in the upper left that shows the Boat House. 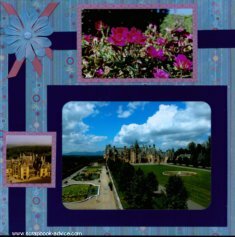 I hope you have enjoyed this section of the Biltmore Estate Scrapbook Book that shows our Fall photos.